It does not bring us great pleasure to say that so far this year, autonomous efforts have been lacking. We would do well to remind ourselves that rebellion exists everywhere, even if it is obscured from our view, yet we remain unsatisfied. The excitement we felt on January 20th, that feeling of potential, has continued to escape our grasp ever since. As Trump took office and millions across the country were moved to take their stand, it was the left who welcomed them with open arms. Anarchists and other autonomous rebels everywhere seemed to be caught off guard January 21st and it seems the Twin Cities have been the slowest to catch up. Above all, it seems that combative efforts have been poured into local anti-fascist organizing. The metropolitan area has seen at least four significant clashes between patriots of one sort or another and anti-fascists in as many months. With each action, there appears to be a downward trend in terms of the anti-fascists’ offensive capacity: each action sees the right closer and closer to a decisive victory. This statement is no doubt controversial, yet it is not the purpose of this essay to examine in-depth the clashes of the past several months. Rather, we intend to examine what we thought were some of the recent peaks of collective autonomous action, in hopes that it could inspire those who feel as dissatisfied with the current trajectory of things as we do. It is clear to us that in the past handful of years, the true height of conflict in the Twin Cities is found in the alleyways off of Plymouth Ave or under the trees adjacent to the I-94. Analyses of these moments are important and incredibly useful. However, they remain spontaneous reactions to a particular chain of events that none of us have any power to set in motion. For this reason, we will instead analyze the series of demonstrations that took place outside the Hennepin County Juvenile Detention Center, or the youth jail. We do this not because we think that noise demos are more important than other forms of action, but with the hopes that this analysis can inspire more creative actions in the future. 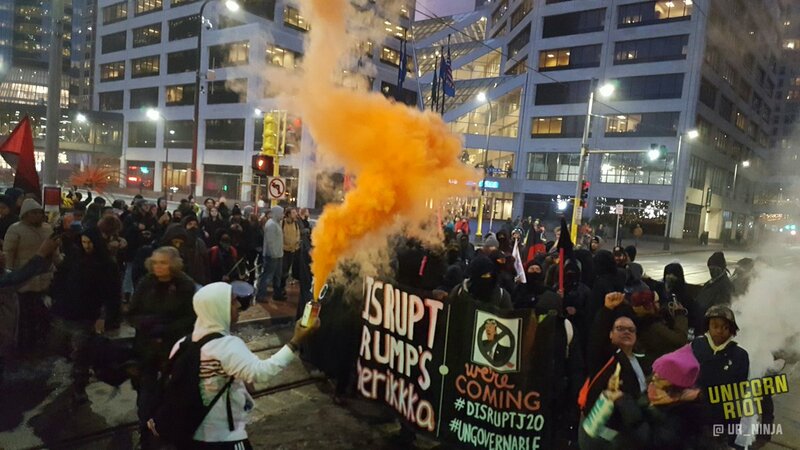 As 2015 came to a close, an anonymous public call went out for a noise demonstration downtown on New Year’s Eve. A small number of people met up by the Government Center light rail station who walked three blocks to the youth jail, displayed a banner and let off a few fireworks. People dispersed quickly without any incident. If the police were aware of the call out, they did not appear to act on it. A few weeks later, this was repeated almost exactly for the January 22nd day of solidarity with trans prisoners. As the summer of 2016 ended, organizing and agitation around the September 9th prison strike had kicked into high gear. In Minneapolis, a noise demo was planned to meet on the 10th at Elliot Park before marching the six blocks the youth jail. The call itself was anonymous but the Incarcerated Workers Organizing Committee of the IWW lent some amount of public organizational credibility to it. On the 10th, around fifty people showed up. The crowd marched to the youth jail and set off several fireworks until a security officer from the facility approached. At that point, the crowd continued through downtown, vandalizing a couple of buildings before stopping briefly at the adult jail housed in the public safety building. The police who had appeared part way through the demonstration kept a distance from the group who marched back to Elliot Park and dispersed. A second noise demo in solidarity with the prison strike was called for October 22nd. This time, the police came prepared with several cruisers circling Elliot Park. Around twenty people arrived for the demonstration, however this time almost everyone wore masks whereas only a minority had at the previous demo. The group took off with a quick pace towards the youth jail, lit off several fireworks and then turned back towards Elliot Park. Dispersal was much more chaotic, with police cruisers following people into the park, and trying to follow some participants home. Regardless, there were no arrests. On New Year’s Eve there was another noise demonstration, following the same pattern from Elliot Park to the youth jail. This call was not circulated publicly, and still managed to draw around fifteen people. Once gathered, the march took off on it’s usual route, and graffiti was spray painted almost immediately. People arrived at the jail and again set off many fireworks while others painted messages on the jail. The group then marched back to Elliot Park but not before shattering one of the facility’s windows. Police arrived within a few blocks of reaching the dispersal point, and again tried to follow people as they dispersed, albeit unsuccessfully. And finally, on January 20th, 2017 a rowdy group of at least fifty people broke away from the mass anti-Trump demonstration at Government Center and proceeded to the youth jail where fireworks were set off. Before long, the crowd continued through downtown, vandalizing a Wells Fargo before blending back into the crowd gathered for the mass rally. While police were ready for the public demonstration, the unannounced breakaway caught them off guard and was only monitored from a distance. With all of this, there are several things to consider in order to hone our collective strengths. First of all, there is the dilemma of announcement: a public call allows for the possibility of people outside our milieus to participate, but ensures police supervision which will no doubt be tight. However, it did not seem to be the case that any of the publicly announced demonstrations benefited greatly due to this, with the exception of those which benefited from public attention to wider campaigns (e.g. the prison strike or the inauguration). If we have the option to gather about twenty people who know each other and a delayed police response, or gather about twenty people and an equal number of officers, the choice appears obvious. As an aside, the first two noise demonstrations also suggest to us the possibility of clandestine fireworks displays. Anyone could go to any prison alone or with an affinity group to set off fireworks and quickly leave the scene. This requires no advance planning besides familiarizing oneself with the terrain. It makes sense to assume that Elliot Park became a focal point of the noise demos because it presented more favorable terrain than Government Center plaza, or anywhere else in downtown for that matter, while still being only a handful of blocks from the jail. It is closer to south Minneapolis, is in a more residential neighborhood, and the park isn’t well lit nor completely surveilled. It may be the best option in the downtown area, which itself is cut off from the rest of the city by highways, but it is still far from ideal. Finding areas where the police can’t easily follow or see into is crucial, but these areas are something cities are well-designed to eliminate. For other targets instead of the youth jail, better dispersal options may present themselves in other areas of the city. These noise demos strike us as important because they were a measurement of our collective capacity. This refers to the number of attendees just as much as the ferocity of the demo, or seeing how many people self-organized to bring their own materials and carry out their own autonomous actions, as opposed to passively participating in something someone else organized for them. While the jail makes for a clear and easy target, and breaking the isolation it imposes on all the young folks locked inside is important, there are other ways to demonstrate our collective capacity. Could they be rebel dance parties through a gentrifying neighborhood? Or spontaneous infrastructural blockades around the city? Maybe it’s better we leave these decisions to those with more vibrant imaginations. We don’t intend to speak condescendingly to those who have dedicated so much of their time and energy into anti-fascist organizing. It is simply that we don’t see a future in these repetitive clashes that chip away at our capacities. If we go on the offensive, if we carry with us a fierce critique of the existent instead of just it’s most virulent defenders, the battlefield might not look so dismal next time we encounter the right.